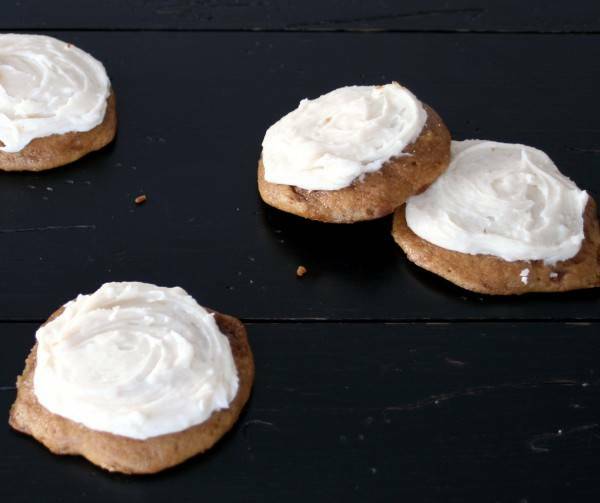 These cookies are soft and cake-like, and the frosting is incredible. My friend Lisa brought these to me after I had my first baby, and they were just the sweet treat I needed. Lisa remembers her mom making these cookies all the time growing up. 1) Whisk together flour, baking soda, and salt, set aside. 2) Cream butter and brown sugar for several minutes. Add in eggs and vanilla, beating well after each addition. 3) Add in half the flour, then half the buttermilk, mixing well. Repeat with remaining flour and buttermilk, and mix until combined. 4) Preheat oven to 350 degrees. Drop by tablespoonful onto lined or greased cookie sheet. Bake 8-10 minutes. Cookies will spread a bit, so give them some space. Remove from oven. Cool for a few minutes, then move to a wire rack. Cool completely before frosting. Beat butter, sugar, vanilla and salt until combined. Beat in hot water by tablespoons until desired consistency. Frosting will set up as it cools, so use right away. If it sets up too much, add in another teaspoon or so of hot water and beat until smooth again.